I don't consider myself to be particularly crafty. I've had spurts of inspiration and ability to do some crafty things throughout my life, but it isn't something I've consistently done. I've mentioned the baby quilt tradition in my workplace. In my over 12 years of employment there, I have worked on quite a few. I also burned out for awhile and either did not contribute at all or bribed someone to put my initials on their square. I've done iron-ons and even partially painted a few things. Mostly for the past several years though, I've done nothing. Nada. We're having an upcoming shower for someone who is actually a good friend of mine. 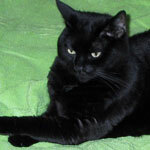 I decided that not only would I do a square for her quilt, but I'd do it all on my own. 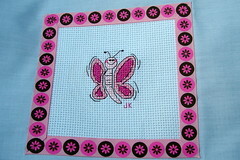 I used to do a fair amount of cross-stitching, so wanted to incorporate that. Her request for the quilt theme was "Pink and Girly." 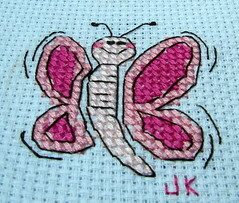 I looked around at the craft store and found a cute little butterfly cross-stitch kit. The only problem was the colors, which were green, blue, orange, and black. So, I modified the colors to pinks and brown, which are the colors of her baby's room. Since I had a white square, I needed something to accent the cross-stitch, which is on white fabric. Ribbon was on sale at Michael's, so I bought several rolls that were in pink and brown. I settled on the one with flowers and I quite like the results. Simple, but cute. And yeah, the corners did not come out perfectly, but like I said I'm not all that crafty after all. I am getting better with my hot glue gun though, which is coming in handy on another project, which I'm working on for the summer. I'll try to get a photo of the final quilt at the shower next week. I think this one is going to be really cute. And pink. And girly. It's so freaking cute! I really like the ribbon border, too. The flowers accent the butterfly nicely. That is really nice ... I'm sure they will love it. I can only cross stich, and paint by numbers. Aww, that's really nice. I love the quilt idea. I go with madretz on this one--aweseome, dude.